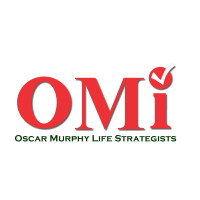 Learn the secrets of Motivating and Influencing through Assessments, Interpretation and Reflection, presented by OMI (Oscar Murphy Life Strategists) and Powered by The Assessment World. Though you were born with certain inherent traits, your environment will have either encouraged these natural tendencies to blossom or suppressed it. Over time these environmental factors influence your style of getting work done and how you respond to the environment and people in it. The 4Cs Factors of Behaviour based on William Marston's work in psychology, accurately assesses your preferred mode of interacting with your environment, the nature of the environment that directs you to behave in a certain way, and discerns your core behavioural motivations, preferences and traits. identify favourable environmental factors which will elicit maximum productivity and satisfaction in every aspect of life. ascertain the drivers behind people's behaviours. 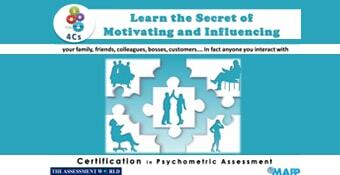 maximize innate skills, realise weaknesses, identify stressors and reduce conflicts. By gaining this level of self-awareness you are in a position to proactively create or seek out external conditions that can bring you success and happiness. 4Cs INNER MOTIVATIONAL FACTORS based on the research of Dr. William Marston - is a Self- awareness profile built on the UPBRINGING and ENVIRONMENTAL INFLUENCES on an individual. 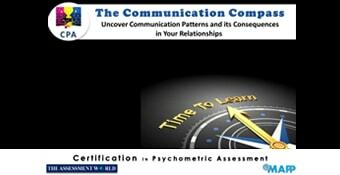 It indicates the C1-CONTROL, C2-CONVINCE, C3-CONFORM and C4-CONSISTENT behaviours of individuals, and helps to evaluate various aspects like drive to over come barriers, ability to persuade etc. It categorizes individuals as people oriented or task oriented, which in turn reflects the style with which they get the work done. It identifies if an individual is 'Active or Passive' and also helps to assess one's orientation in terms of TASK Vs PEOPLE. 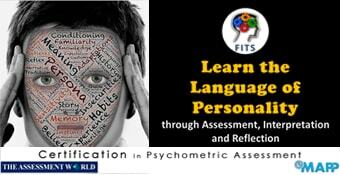 Psychometrics produces 'mirroring effect' of an individual or group of individuals covering both their personality and intellectual ability. OMi’ans, the catalysts, not only facilitate these assessments effectively but also assist by suggesting & designing the roadmap to success. Whether individuals’ one-on-one coaching session or teams in different training workshop, the insight from these tools coupled with experienced OMi’ans, are valuable sources to help drive change and transform behaviour in a holistic way. I appreciate & commend OMi for including this scientific approach in all our training workshops and in enabling us work towards our mission of enhancing customer service excellence thereby enabling continuous & everlasting results.